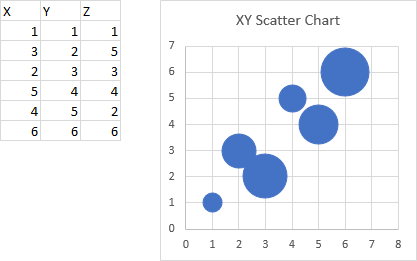 Someone in the Excel Reddit was asking about making a combination chart by adding a scatter chart series to a bubble chart. He wanted to draw a customized trendline, and you can’t connect points with lines in a bubble chart. You can add a trendline to a bubble chart, but you are limited to the standard options. 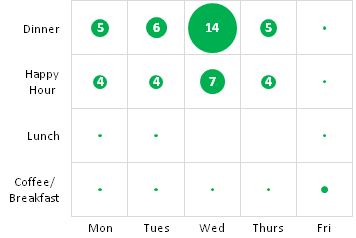 But you can create a “scatter bubble chart” if you adjust the size of the markers in a scatter chart. It can be a bit tedious to do this manually: you need to figure out how large to make each marker (and as Barbie once famously said, “Math is hard”) and then you have to format each one. Extract the series formula of the first series of the active chart (if no chart is selected, the program aborts). Determine the range containing the Y values. Find the range containing the bubble values. 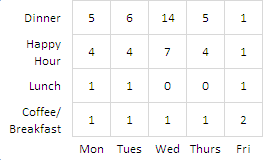 If Y values are in a column, the program uses the next column; if Y values are in a row, it uses the next row. Ask the user how large the largest bubble should be (the default is 40). Loop through the points in the series, calculating the size of the marker. Markers are scaled based on the square root of the bubble values, so their areas are proportional. 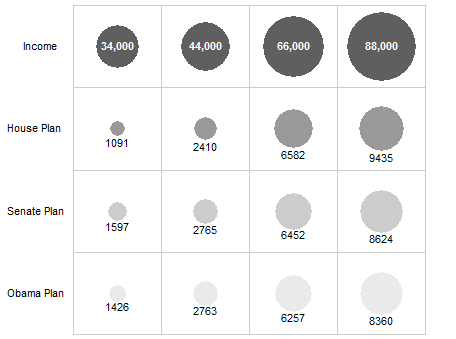 Here is an Excel bubble chart made with a simple three-column data set. the first column contains the X values, the second contains the Y values, and the third contains the Z values that set the bubble size. Here is an Excel scatter chart made using the first two columns of the range. 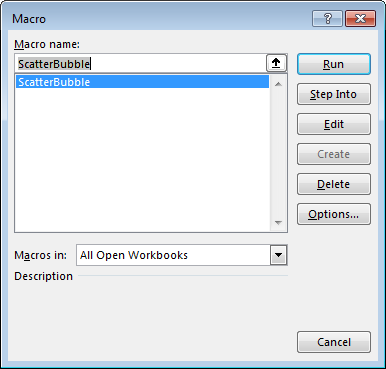 Press Alt+F8 to open the Macro dialog, select the macro ScatterBubble, and click Run. The macro asks how large the largest bubble should be. 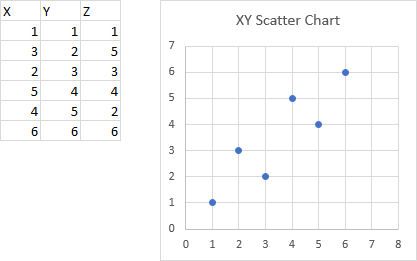 Finally, here is the scatter chart with resized markers. Nearly indistinguishable from the bubble chart shown above. I used a largest bubble size of 37 to make it match so closely. Here is the VBA procedure ScatterBubble which created the Scatter Bubble Chart above. Posted: Tuesday, January 16th, 2018 under VBA. Heat maps are a popular way to display varying values in a two-dimensional display. The heat map may be an actual geographic map with regions colored differently according to some variable, for example, population density or electoral results. I showed such maps, also called cartograms or choropleths, in Redrawn Electoral Maps and An Undistorted Election Results Map. Heat maps are not just used for alternate representations of geographical maps. They can be used to map out sectors of a hard drive, or performance of various companies or industries in the stock market. 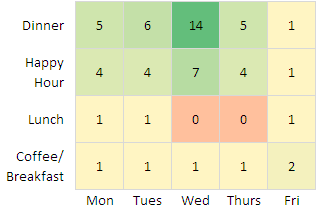 In this post I’ll show a simple heat map showing relative values within a 2D worksheet grid, a crosstab of days of the week and times of day. In Columbus Web Analytics Wednesday — Feedback Analysis, Tim Wilson of the Gilligan on Data blog surveyed attendees at a Web Analytics meeting to find out what times are good for holding future meetings. It was a simple enough survey, and there were 21 respondents. Tim broke out the results in a bubble-style chart, which I reproduce below. Obviously the respondents were not limited to one choice. 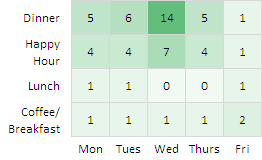 From Tim’s chart, it is evident that Happy Hour and Dinner time slots work best, and Wednesday is the best night of the week, with Monday, Tuesday, and Thursday all at nearly the same distant second place. Compare the size of a “1″ to the size of the “14″ — does it look to you like the larger circle is fourteen times as big as the smaller one? It doesn’t to me. It doesn’t to me, either. We seem to underestimate the differences when areas are used to encode values. It’s the opposite when diameters are used. I think we overestimate the differences to an even greater degree. I didn’t even label the smallest data points, because the labels would have obliterated the circles. The purpose of this chart is to get a quick idea of the survey responses, so the bubble approach isn’t really inappropriate (even the bubble chart based on diameter). Its point is readily understood, and since there is a clear winner, that winner stands out. But there are alternatives, and I decided to see how a heat map would work. Heat maps are pretty easy to generate in Excel 2007 using a worksheet range and conditional formatting. Start with a simple worksheet range. 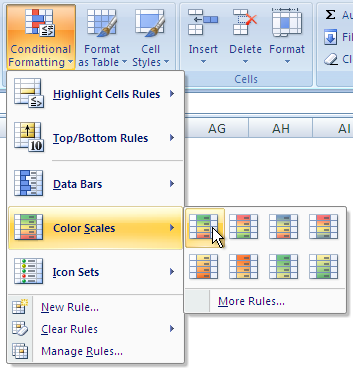 The Conditional Formatting command is accessed from the Home tab on the Excel 2007 ribbon. Hovering the cursor over the button shows the fancy Super Tooltip below the ribbon. Clicking on the Conditional Formatting button shows a series of built-in formatting styles plus some style management commands at the bottom. Color Scales has the built-in color gradients. For this data, I selected the first one, which goes from red at the low end, through yellow in the midrange, to green at the high end. The result is much as expected, but I thought the red and yellow were both a bit overstated. In fact, it would seem better to use a single color that ranges from a low saturation at the low value to a high saturation at the high value. A one-color display is simpler to understand, and does not discriminate against those with color-deficient vision. 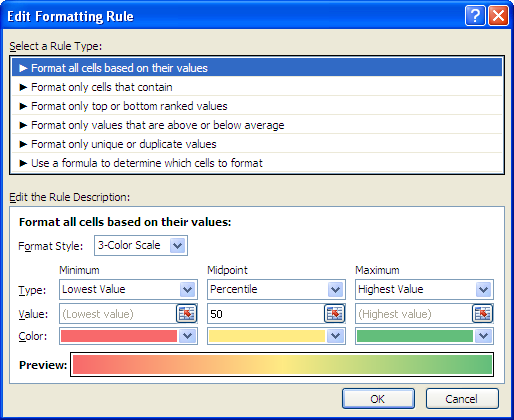 I went to Manage Rules on the Conditional Formatting dropdown, which opened the Rules manager. I selected the Graded Color Scale rule, which I just applied, and clicked Edit Rule. I switched to a two-color scale, kept the green shade at the high end, but selected a very lightly saturated shade of the same hue for the minimum. (I could have chosen white, but the faintest shade of green makes it obvious that the rule is being applied to the entire range. The result isn’t too bad. Like the bubble chart, it’s reasonably self-explanatory. With little conscious thought, it is apparent light for low values and darker for higher values. The winning value stands out clearly. Another nice feature of this graphic is that is is very compact. Posted: Wednesday, March 17th, 2010 under Chart Types. Tags: Bubble Charts, Heat Maps. Okay, as you move left to right, the bubbles get larger. The bubbles in the top row are larger than the rest, but except for the first bubble in the second row, the bubbles don’t change much from row to row. If not for the numerical labels, we wouldn’t notice any difference at all. Apparently bubble area, not diameter, encodes the values; if diameters controlled size, the leftmost bubbles would practically disappear. On closer inspection, I noticed that the top row of bubbles, Income, obviously uses a different scale than the others. Given our difficulty in judging bubble areas (or diameters), and given the unannounced scale change between Income and Family Contribution, the data may as well have been presented in a table. 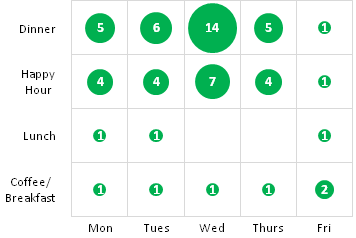 It has the same grid and numbers, but is smaller and lacks those distracting circles. 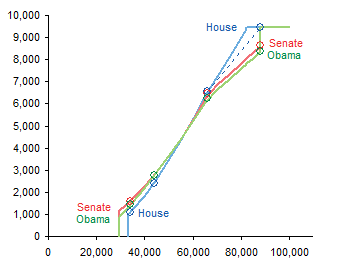 However, you can make much sense of the data if you make a simple line chart. Now you can see the similarities and differences in the three plans. But I thought this was a bit simplistic, a bit incomplete. I spent ten or fifteen minutes at the Kaiser Family Foundation Health Reform Subsidy Calculator and filled out the data. When you’re making a bubble chart, you don’t need many data points, in fact, you can’t accommodate many data points. 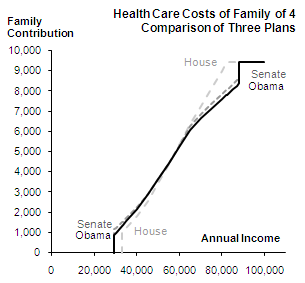 But a line chart can represent a continuum of data points. 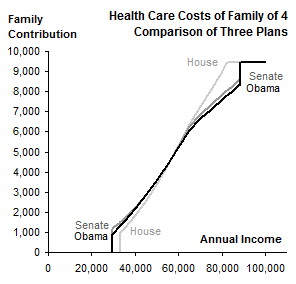 In this chart it becomes clear that the plans are similar in the middle of the income range, but differ at the ends, not only in the costs, but also in the income levels where the plans kick in at the low end and where the plans reach maximum contribution at the high end. If we superimpose the data from the bubble chart onto the line chart, we see that the bubble data actually shows a smaller difference between the plans at the high end than we can see in the line chart. Nice chart and all, but I’ve neglected some details. There are no titles in the chart, so someone reading the newspaper would actually have to read the article to get the story. Also, except for USA Today, most newspapers are limited to black and white graphics. And the charts I’ve made are rather large for their data content (though smaller than the original bubble chart). So how can we make this chart more suitable for a newspaper? Shrink it, add titles, and convert the colors to black and two shades of gray. You could use dashed or dotted lines as well. 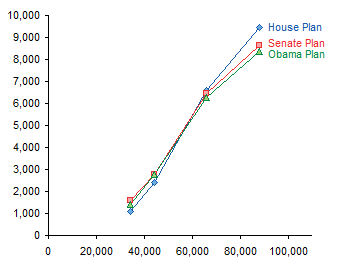 Excel up to 2003 does poorly with thicker dashed or dotted chart lines, but Excel 2007 renders these features nicely. Posted: Monday, March 1st, 2010 under Chart Busters. Tags: Bubble Charts, line charts. Posted: Wednesday, April 8th, 2009 under Charting Principles. Tags: Bar Charts, Bubble Charts, Maps.